Vacuum Sealer and food seen here. The FoodSaver v2244 vs v3240 is a comparison of two very capable vacuum sealers. These sealers are very similar to one another and have met a lot of people’s needs. So with that, you can’t really make a terrible choice here. There are some important differences between these machines that could sway you in one direction or the other and that’s what you’re here to find out. 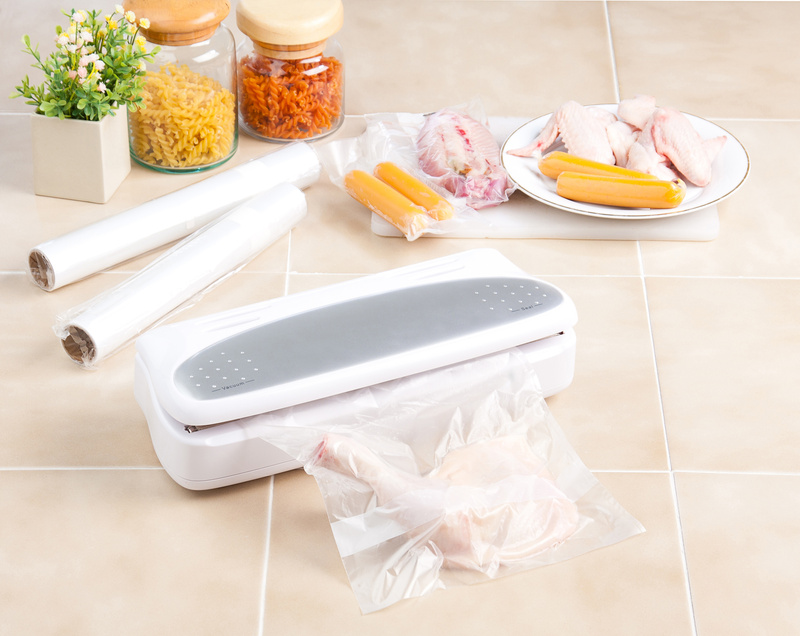 I find that vacuum sealers are one of the most important machines that you can purchase for your home. If you regularly find food in your freezer with more frost on it than an evergreen tree during a blizzard then you should be in the market for a vacuum sealer. Below, you will find all of the information that you need to make the best decision in this comparison. Foodsaver V2244 vs V3240: Which One Should You Get…? There are some major differences in the appearance of both of these machines. For one the older and more popular v2244 is black while the 3240 is white in color. The shape is a little different on the 3240 as well, it is taller and deeper than the v2244. The v3240 measures about 11H x 9D x 19L inches compared to the v2244 which measures about 6H x 11D x 18L. These measurements are not exact but close enough. This could be meaningful to you if you think that one model will work better in your kitchen that the other for space limitations. Neither machine is very heavy, so this should not influence your decision in the slightest. You will easily be able to store the machine in a higher or lower cabinet. Either of these machines will accomplish your goal which is to save your food from oxidation by removing as much air as possible. We own a FoodSaver and it works wonders by saving us money and time. It helps us to stay organized. But there are some key differences in how these sealers work and the features they offer to you. The v2244 is the older model of the two. To operate you must make a bag from a roll or start with a precut bag. You then fill the bag with food. You then seal the bag by inserting the open end of the bag, pushing the lever downward, and pressing the seal button. If you are sealing a delicate food item like chips or cereal, you can press the seal button to avoid crushing. Speed Settings – You can choose between gentle and normal speeds. The gentle speed is for those delicate food items. Moist and Dry – You can also choose between moist and dry food settings. There is an important distinction in how moist and dry foods are handled. Moist food requires additional heating time to make a proper seal as liquids that get between the layers of the bag have a cooling effect that can make it harder to keep a tight seal. Now, these additional features that the v3240 has aren’t necessary but they are nice. If you are using a vacuum sealer to seal very moist or mostly liquid foods you are going to run into an unavoidable issue. That is, so much liquid will get between the bag layers that A.) You will end up vacuuming out more of the juices than you want to B.) Not enough air will be vacuumed out of the bag, C.) You won’t get a proper seal, or D.) You will experience a combination of A,B and C.
The simple – but not always practical – solution would be to pre-freeze the food before you vacuum seal it. This will ensure that those natural and delicious juices are preserve as best as possible. However, when you’re in a pinch you may not want to use this as a solution. A really convenient feature is the addition of the bag storage and cutter that is built into the 3240. We also have this feature on our model as well. And I must admit, it does make things very convenient. All you have to do is pull the roll out to the desired length then cut the bag by moving the cutter from one end to the other. For the most part, cleanup is simple. Just wipe down the surface of the vacuum sealer then empty the drip tray. The patented drip trays are easy to clean and remove from the tray holder. But there are little crevices around drip tray that may be harder to clean. It’s a minor annoyance that we’ve gotten use to by now. I like to research through many many customer reviews before making an opinion. There are just too many variables to take a small sample number serious. As with any product, you will find a share of naysayers. This is true with both of these vacuum sealers. They both have complaints from users whom claim that their little sealer broke down in a time frame that was shorter than they would’ve expected. I found some complaints of gaskets wearing out on v2244 but this seems to be the case of parts wearing out just like they do on cars, bicycles, and other goods. But some people get the impression that small appliances don’t need maintenance or have parts that wear out. After researching the v3240 I’ve also come across those whom claimed that they experienced inconsistencies in performance. There were those that claimed the machine broke down quickly, etc. Others complained that too much bag material is wasted when sealing. After researching these products I think that they should last a good while, as long as they aren’t abused. Both of these machines are backed by a standard 1-year limited warranty. There is plenty of warranty information available on Amazon or directly at FoodSaver.com. Both of the models in the FoodSaver v2244 vs v3240 comparison are good buys. They offer affordability and practicality to your kitchen. I have one, and after using one, I think that a vacuum sealer is one of the most important tools that you can have in your home, even if that means that you go with a completely different model – there are lots of options to choose from. If I had to choose however, I’d go with the v3240 because it is simply the more advanced machine and the price difference between the two wasn’t so steep that it would make me uncomfortable. Of course, a sale price can change that and could further influence your decision.